The Cocoon Nebula is in the constellation of Cygnus (the Swan) and is about about 4,000 ly away, and the central star that lights it formed about 100,000 years ago. The nebula span about 15 light years. The dark nebula Barnard 168 (B168) forms a dusty lane that surrounds the Cocoon Nebula and projects westward forming the appearance of a trail. This is my third target using my new ASI071. 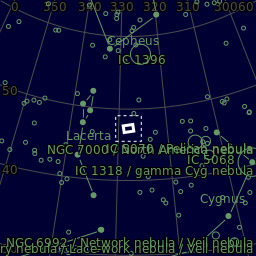 The object was near zenith, no visible clouds or moon, and a nice Milky Way accross the sky. My SQM showed 21.1. Even guiding was good (0.5"RMS). But, for some reason I ended up the a very strong green tint on all the subs. After much tweaking with colour curves and other colour adjustments in PS I finally reached a presentable image but it was a heck of a job and I initially gave up for a while. Thanks to friends at SGL, the green tint mystery was solved. For some reason the camera software had set white balance to 0, so since most of the signal is collected by the green pixels in the bayer mask it becomes green. I am now back to the default (99/60) setting for white balance. Good thing is that no data was lost and it did not affect the final outcome of the image.